Lobsang Sangay, political leader (sikyong) of the Central Tibetan Administration in exile, is currently visiting Japan. 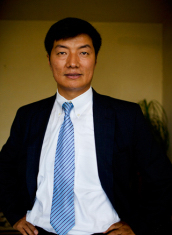 As part of an ongoing Global Leadership Program, we invited Lobsang Sangay to lecture on Leadership and Resilience. People in leadership roles are responsible for making decisions in various situations as they arise. These decisions impact on the lives of others. From what viewpoint do leaders make these decisions? This is an opportunity to hear from a leader who has experienced the turbulent history of Tibet as a refugee, a Harvard scholar, and a political leader. Come and join us in listening to a unique leadership perspective.